On Tuesday February 20th, the long awaited South Africa regulations were published. The intent of the regulations was to abolish what many consider abhorrent hunting practices in South Africa including hunting drugged animals, ‘canned’ hunting of large predators such as lions in small enclosures, and other methods deemed to run counter to fair-chase methods. It appears that Hippo, and Buffalo are still available to bowhunters wishing to hunt RSA as they are not specifically mentioned as prohibited activities within these regulations. And plains game hunting is still available to bowhunters. Today, it gives me great pleasure to publish the regulations that pertain to threatened and protected species. These regulations will come into effect on 1 June 2007. The regulations are a culmination of a three-year period of consultation between government, civil society, the wild life industry as well as animal welfare groups. They also take into account several recommendations by a panel of experts, which I appointed in January 2005. For the first time nationally listed species will now have uniform conservation status across the country. Government will have new muscle to ensure that our biodiversity is utilized in an ecologically sustainable way. A broad range of restricted activities will now require permits. The illicit trading of our endangered fish, bird and plant species, like cycads, will be rooted out. The same legal standards will apply throughout the country, closing loopholes and removing discrepancies between provinces. In support of these regulations, our initiatives to improve law enforcement demonstrate Government’s resolve to protect our biological heritage. The Green Scorpions will continue to play a key role in ensuring compliance. The Regulations introduce a uniform national system for the registration of captive breeding operations, commercial exhibition facilities, game farms, nurseries, scientific institutions, sanctuaries and rehabilitation facilities. These institutions will be required to meet strict criteria. For the first time, provision will be made for the recognition of hunting organizations and the application of codes of ethical conduct and good practice. The introduction of game farm hunting and nursery possession permits will streamline the permit issuing process. It will also compel permit holders to provide critical information to the authorities, which will assist in assessing the status of biodiversity in the country. In order to meet our CITES commitments, we are establishing a national scientific authority, which will replace the current fragmented system. The new authority will enable uniform implementation and provide access to scientific information beyond just CITES species. As a signatory to the international Convention on Biodiversity, South Africa has a commitment to the sustainable use of our natural resources. We understand the huge responsibility that rests on our shoulders to nurture the ecological and economic value of our biodiversity. Therefore, we must protect the integrity of our ecosystems to ensure their long-term contribution to tourism and job creation. These regulations empower us to do this. 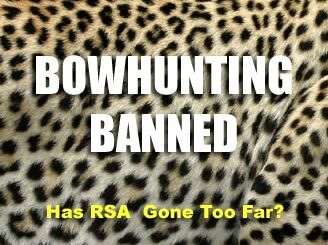 We are putting an end, once and for all, to the reprehensible practice of canned hunting. The regulations specifically prohibit hunting large predators and rhinoceros that are “put and take” animals - in other words, a captive bred animal that is released on a property for the purpose of hunting within twenty four months. South Africa has a long-standing reputation as a global leader on conservation issues. We cannot allow our achievements to be undermined by rogue practices such as canned lion hunting. More broadly, the regulations signal the start of a clean up of the hunting industry. They lay the basis for a well-regulated and ethical hunting and game farming industry in South Africa. Whilst we applaud their substantial and positive contribution to conservation management and economic growth, we also have a responsibility to preserve the resource base and ensure that the industry has a sustainable future. In order to do this, we must balance economic objectives with conservation management objectives. Hunting is an important industry, but we must manage it in accordance with ethical and defensible standards. The regulations include prohibitions and restrictions on certain activities and methods of hunting. For example, hunting thick-skinned animals and large predators with a bow and arrow will be prohibited and hunting from vehicles will no longer be allowed. The implementation of these regulations will be the first step of a two-step process to clean up the hunting and game farming industry. The next step will be to promote even greater uniformity with regard to elements of the hunting industry that we are not dealing with today. We will introduce national norms and standards that provide a framework for provincial regulation and further streamline permitting. This will also be developed in close consultation with the industry, provincial authorities and other stakeholders. Publication of lists of critically endangered, endangered, vulnerable and protected species.